Mercedes is wondering what Clay has in store for her today. 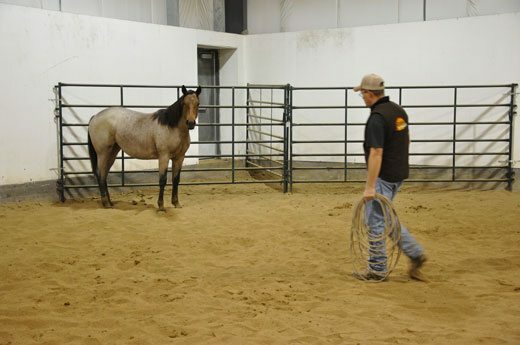 In Mercedes’ first roundpen lesson (posted April 4, 2010), the young yearling filly was brought into our arena roundpen and taught the basics of human handling. 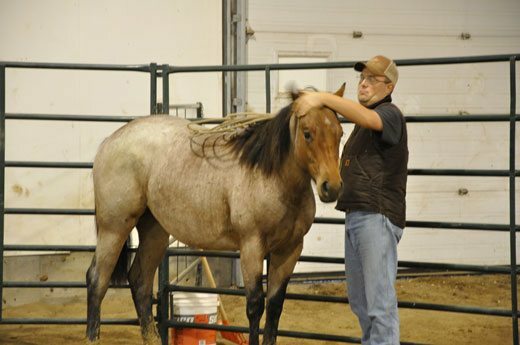 While this filly is already halter broke, Clay basically wanted to teach her to have her attention on him at all times. 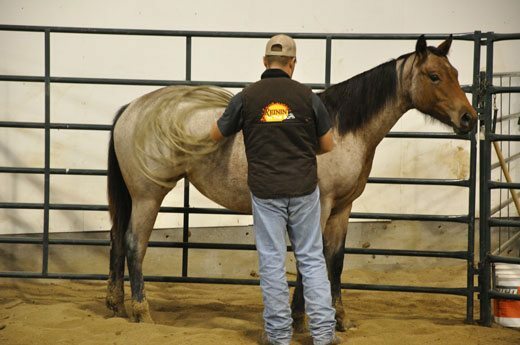 The first session took approximately 25 minutes and when it was done, Mercedes willingly allowed Clay to approach her and touch her shoulders with his lariat. He did this using an “Approach and Retreat” philosophy. 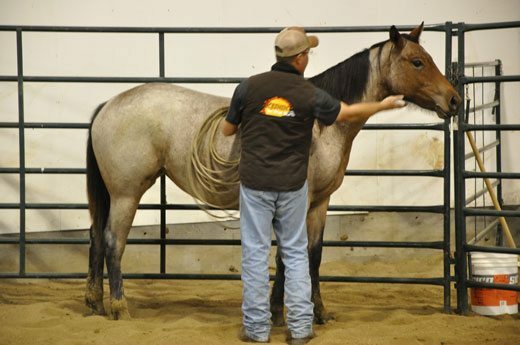 In this next lesson, Clay will put Mercedes through the same paces as in the first session, but the goal this time is to be able to touch her in several areas of the body without Mercedes retreating. Clay tests out what was learned in the first lesson. Mercedes is definitely unsure but she has not moved away from Clay’s lariat yet. 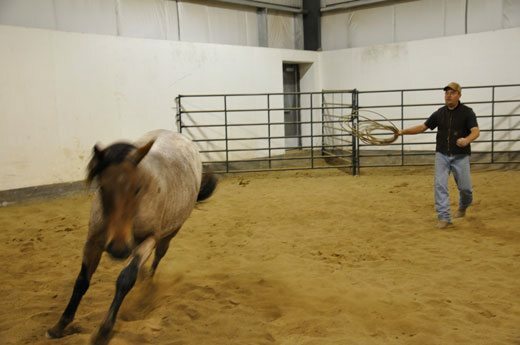 Clay was unable to really “touch” Mercedes, so he sends her around the roundpen to work. 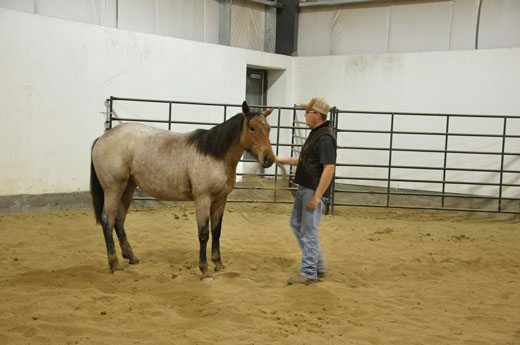 He wants the filly’s heart, lungs and muscles to help explain to Mercedes that it would be a lot easier to just stand and allow Clay to touch her body. Still, Mercedes declines Clay’s invitation to stand, so he sends her around to work again, taking great care to stand back from her hindquarters. 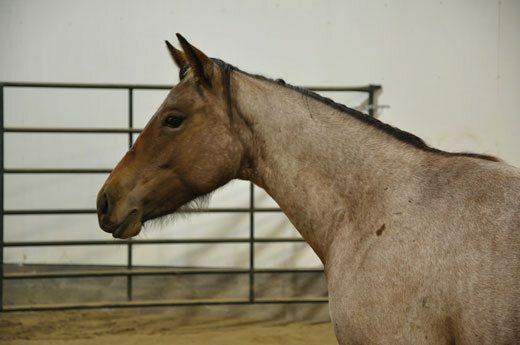 Finally the filly thinks about it a little bit and turns to face Clay. He approaches her. 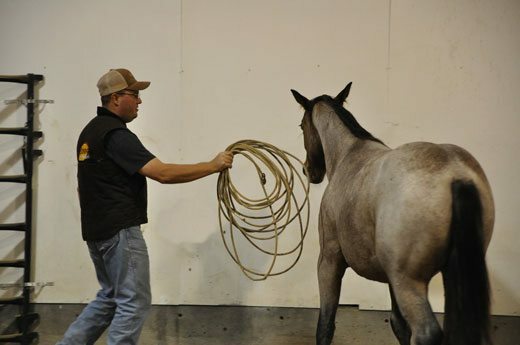 Clay wants to be able to rub her all over, with the lariat. Another good note to end the lesson for today.